I've sadly let this blog fall into disuse, but I've been doing some thinking that I find significant, but my Flickr page really isn't the right place to go on and on like I can here. So here goes: there's something that's been bothering me about representational folding. Yes, we have technical complexity, and with it paperfolders have done some truly amazing things. 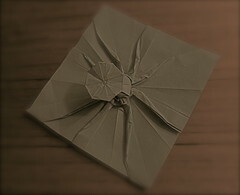 Some prominent origamists have, however, noted that many creators tend to pursue complexity without regard to artistic expression, sometimes even forsaking aesthetic pleasure to add more detail. This has become a widely accepted opinion, but I think it neglects a more important issue: in the pursuit of more detail, are we forgetting the principles of good design as well? I think there's a balance to design philosophy that is often ignored; yes, we must know when, how, and where to put in another point or two for detail... but we also need to keep in mind when NOT to put in another point. This spider is an example of what I'm talking about; there are all these ways to avoid putting in more points than are necessary, and these often lead to cleverer, more elegant models that we would otherwise end up with. I could have created a spider with eight legs and an abdomen, a total of nine points; but instead I created this one, which only uses one. It's much a much more efficient paper distribution, and can therefore be folded with a paper that will give it weight, without sacrificing the thinness of the legs. At this point, with boxpleating and circle-packing techniques, it's really not that hard to create a complex model. What's still hard is to create a clever model, whether complex or not; and this provides a creative challenge that I think a lot of today's creators need. We need to stop thinking in terms of numbers of points, and evaluate models based on their aesthetic and intellectual value.